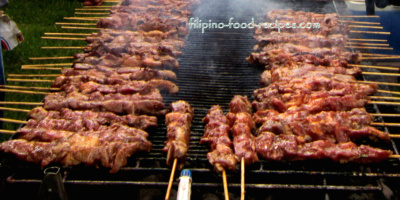 The Filipino barbecue is made from pork sliced thinly, skewered on a bamboo stick, and usually cooked over charcoal. 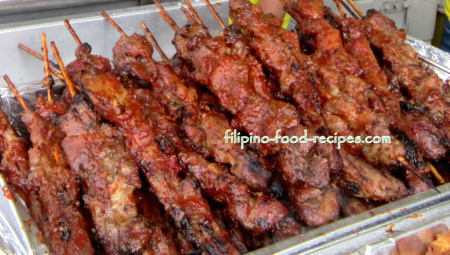 What we call Filipino pork barbecue are known as Pork Kebabs, or skewered meat by most other cultures. Sweet, salty, and not-so-tangy, it uses a wet marinade of soy sauce, sugar, a can of lemon-lime flavored softdrink (7-up), chili peppers and a generous amount of garlic. The marinade is then mixed with banana catsup for basting during grilling. We usually slice the pork against the grain and on a slant because this makes for a tender pork once cooked. Also, we cook it on high heat for just a few minutes on each side while basting continuously. The longer the pork is grilled, the drier and tougher it gets. Around here in the Northeast US, you will find this kind of barbecue on Fairs and Swap Meets or Flea Markets being sold by our enterprising Kababayans as Asian Barbecue, and teamed up with Pancit Canton or Chow Mein and Vegetable Fried Rice. 1 Mix the soy sauce, sugar, garlic, chili and 7-up together. Add the cut pork pieces and marinate inside the refrigerator for minimum 4 hours and maximum 12 hours. 2 Heat up the grill. 3 Skewer the pork onto the bamboo stick. Set aside 1/2 cup of the liquid from the marinade. 4 Prepare the basting sauce by mixing equal portion of the liquid marinade and banana catsup. 5 Grill for 3 minutes on each side while continuously basting. 6 Once golden brown, take off the grill and serve with a spicy vinegar sauce. Try not to marinade more than 12 hours. The pork could get too salty and the flavors tend to break down from over-marinating. It is not advisable to re-use a marinade, or to add-on meat to a batch that has been soaking for an hour or so. Try to make a fresh marinade every time. Submerging the bamboo sticks in water overnight will solve the problem of sticks easily breaking and catching fire on the grill. If you like your Filipino barbecue with some fat, skewer the pork fat at the bottom of the stick and never in the middle or between the lean cuts, because the fatty cut always shrinks (and catches fire on the grill). You don't want your barbecue to be uneven in the middle. Try not to overcook the barbecue. Like searing meat, use high heat so you only need to cook for a few minutes on each side.